The probe into Sandra Bland's hanging death inside a Texas jail — which a medical examiner ruled a suicide last week — now includes the possibility of murder. Editor's note: This story has been updated to include additional details. HEMPSTEAD — The probe into Sandra Bland's hanging death inside a Texas jail — which a medical examiner ruled a suicide last week — now includes the possibility of murder. "This is being treated like a murder investigation," Elton Mathis, Waller County's district attorney, said at a press conference Monday. Mathis said he made the determination after talking to Bland's family and to those who saw her last, including the bail bondsman, who was among the last to hear from her alive. Bland, 28, was found dead on July 13 inside the Waller County Jail, three days after she had been pulled over by Texas Department of Public Safety Trooper Brian Encinia for an improper lane change. She was arrested and taken to the jail on a charge of assaulting a public servant during the traffic stop. "There are too many questions that need to be resolved. Ms. Bland's family does make valid points. She did have a lot of things going on in her life for good," Mathis said. The district attorney also said the dashboard video of the traffic stop in Prairie View that was retrieved from Encinia's patrol car would be released on Tuesday. After viewing the video, Mathis said Bland was not "compliant" with the officer's directions. "Sandra Bland was very combative. It was not a model traffic stop. It was not a model person that was stopped," Mathis said. On Friday, DPS reassigned Encinia to desk duties because the dashboard camera video revealed violations of traffic stop procedures. Multiple agencies, including the Texas Rangers and the Federal Bureau of Investigation, have announced investigations into Bland's death. Mathis said on Monday that the Texas Rangers are the primary investigators and that the FBI was supervising. A partial video of Bland's arrest, shot by a bystander and uploaded to the internet a week ago, has sparked nationwide outrage. In the video, which is less than two minutes long, Bland can be heard yelling at what appears to be two officers who are talking to her as she lies face-down on the ground, her hands cuffed. She shouts that she can't feel her arms. As Bland is escorted by the officers to a patrol car, she thanks the person filming and is heard saying: "For a traffic signal, threw me onto the ground and everything." The escalation of a seemingly routine traffic stop into an arrest and eventual death has cast Waller County, which is northwest of Houston, into an unwanted spotlight. The incident is the latest in a long lineup of questionable police arrests of African-Americans this year. Bland, a Chicago-area resident, was returning to Prairie View A&M, her alma mater, to take a temporary job with the Cooperative Extension Services that was to start on Aug. 3. She graduated from the School of Agriculture in 2009. 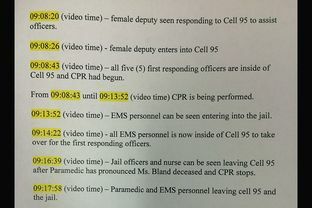 On Monday, the Waller County sheriff's office, which oversees the local jail, released a three-hour video showing the outside of Bland's cell during the last three hours of her life, including the discovery of her lifeless body. She was found strangled inside the cell with a plastic trash bag taken from a waste can inside the cell. The discovery was made about an hour after a jailer had last checked on her. According to the sheriff's office, the trash bags were allowed inside cells, based on a recommendation by the state's regulator: the Texas Commission on Jail Standards. But after Bland's death, all trash liners have been removed from all cells in the Waller County Jail pending further direction from the state agency, said Capt. Brian Cantrell, chief of investigations for the Waller County sheriff's office. Cantrell, also present at the news conference in Hempstead on Monday, offered new details about Bland's booking into the jail. He said the arrest charge against Bland on July 10 — assaulting a public servant — required her to be classified as "high risk" and that was why she was separated from other female inmates. There were no other "high risk" female inmates in the same cell at the time. Cantrell said Bland had no injuries when she came to the jail. He said she was placed in the cell after a deputy processed her arrest paperwork and read from a sheet of standard questions posed to inmates, asking her about her health, including her mental health. "There were no reported injuries by Ms. Bland to jail staff and no medical treatment requested," Cantrell said. Following Bland's death a week ago, the Texas Commission on Jail Standards reviewed the Waller County Jail's logs and notified the sheriff's office that the jail had violated minimum standards in two areas: providing staff training as it pertains to health services for inmates, and failing to follow rules regarding the observation of inmates once they are detained. 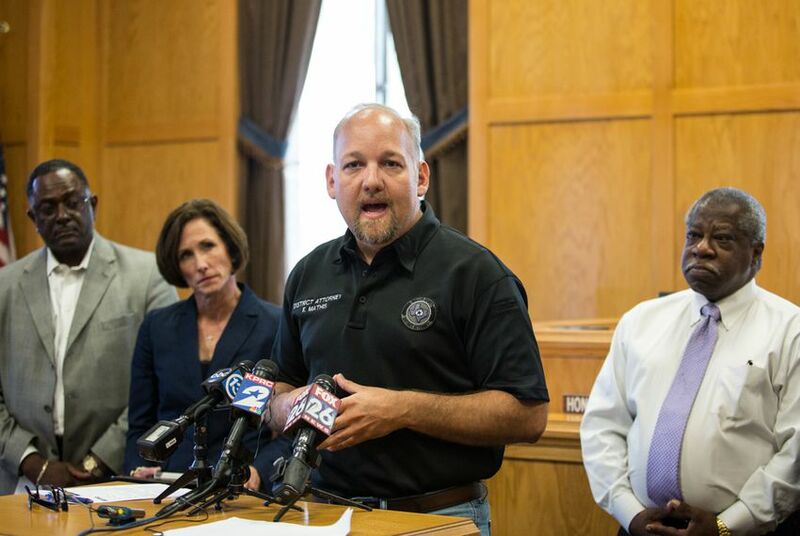 For years, racial inequity has punctuated Waller County's political landscape, which has been fraught with everything from kickback schemes to allegations of voter suppression and police brutality. Hempstead, the county's seat, is located next to Prairie View, home to Prairie View A&M University, the historically black college. Both towns sit along U.S. 290, a main Houston-to-Austin artery. In 2003, then-Waller County District Attorney Oliver Kitzman sparked outrage when he questioned whether Prairie View students could vote in local elections, a point challenged by Texas' attorney general's office. The following year, Kitzman, who is white, announced he was resigning from office. Earlier this year, Prairie View students celebrated their own polling station. In 2007, the city of Hempstead's council members fired then-Police Chief Glenn Smith following allegations of brutality against young black men. Smith disputed the charge, saying he was removed because of small-town politics. In 2008, Smith successfully ran for sheriff and is the county's top lawman today. In 2009, Hempstead's former mayor pro tem, Larry Wilson Sr., and city alderman Paris Kincade were sentenced to prison for accepting kickbacks for city contracts. Also sentenced was then-Justice of the Peace DeWayne Charleston. All four men are black. Bland's death is eerily similar to that of James Harper Howell IV of Bandera in November 2012. Howell, a 29-year-old white man, was discovered at the Waller County Jail hanging from a bed sheet tied to a ceiling vent in one of the jail's common areas, the Houston Chronicle reported at the time. Howell had been in custody for more than a week after he was arrested by a DPS trooper for assault on a public servant, evading arrest and detention with a vehicle, and felony possession of marijuana. As is the case with Bland's death, the Texas Rangers, a division of DPS, were called in to investigate. The Texas Tribune asked for a copy of the Rangers' report on Howell's death, but it has not immediately been provided. Attempts to reach Encinia, who worked for Blue Bell Creameries and the Brenham Fire Department before joining DPS in 2014, have been unsuccessful. "He was an excellent firefighter," said Ricky Boeker, Brenham's fire chief. "We were sorry to see him go. He was very detail-oriented. We really hate that he left." Alana Rocha contributed to this report. 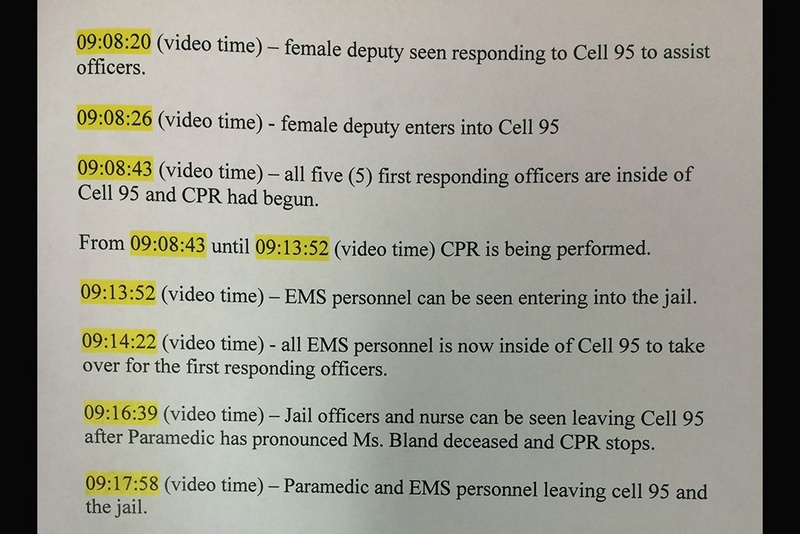 The Waller County sheriff's office's timeline of the discovery of Sandra Bland's body and subsequent EMS response.